Zinc is needed in over 100 enzymes and involved in a myriad of essential body functions. It functions as an antioxidant and is involved in carbohydrate metabolism and the activation of vitamins, especially B vitamins. GNLD provides high purity and potency zinc, plus amino acid chelation for improved absorption. Zinc is needed in over 100 enzymes and involved in a myriad of essential body functions. Zinc functions as an antioxidant. Zinc is involved in carbohydrate metabolism. Zinc is involved in the activation of vitamins, especially B vitamins. Because the best food sources of zinc are meat and seafood, vegetarian or low-meat diets may provide less than the 12-15 mg of zinc required daily for optimal well-being. Highest potence and purity - our pharmaceutical-grade zinc base provides both high purity and high potency. In our unique chelation process, pharmaceutical-grade zinc is reacted with the amino acid methionine. 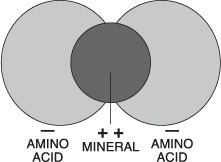 In this process, two amino acid molecules bond with each zinc atom to form our exclusive 2-to-1 zinc amino acid chelate. 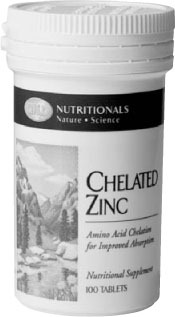 Tests show that amino acid chelation improves zinc absorption. Pharmaceutical-grade raw material provides high purity and high potency. Amino acid chelation for improved absorption. Take 2 tablets daily as a supplementary source of zinc.